We left Le Treport as the sun rose, which wasn’t as early as it sounds given that the shortest day was quickly approaching. Our ferry was booked for 11:35 so we had just enough time to make the drive to Calais and sit in the queue for about an hour where we were planning to have a late breakfast. 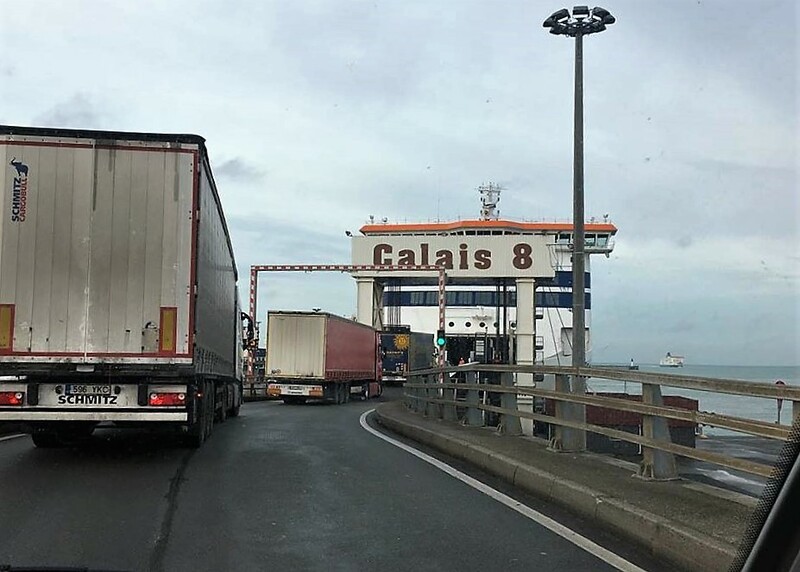 When we got to Calais the previous ferry was slightly delayed and without any opportunity to protest we were ushered onto it with a few remaining lorries, feeling tiny and insignificant amongst the big brutes. Paul was chuffed that we were saving some time, but I was disappointed. I love sitting in the queue with a cuppa watching the other motorhomes turn up, wondering where they have been and where they are going. Plus I was starving and begrudged spending money on a ferry breakfast when I had perfectly good food on board Bertie. The forecast was for the winds to pick up, but these ferries are so large and stable that any wave action is difficult to discern especially when sat down. Only an occasional sway gave away the size of the waves. We watched the sea and the gannets from a prime window seat. There were very few passengers onboard. Our arrival in the UK was before midday and gave us the opportunity to drive all the way home without a break – we took it – the excitement of being back in the UK and seeing family kept us going on the drive along the M3 and A303 all the way back to Taunton. It’s lovely to be home for Christmas.